Quinidius (French: Quenin) (died February 15 c. 579) was a French saint. He was born at Vaison-la-Romaine to a noble Christian family. As a young man, he became a hermit near Toulon and then at Lérins Abbey to devote himself to a life of prayer and asceticism. Esteemed for his piety, he was recalled to his natal town by Theodosius, Bishop of Vaison. He was made an archdeacon. He was himself elected Bishop of Vaison in 556, and achieved a reputation for charity and fairness. He participated in the Councils of Paris of 558 and 573. He resisted the claims of the patrician Mummolus, conqueror of the Lombards. The wiki on St. Quinidius, with a little bit more about him, can be found here. We have much to be thankful for. Throughout human history, famine was an ever constant threat. Man, most even, always wondered if they would be able to put food on the table the next day. We here in the west rarely have such concerns. Only the poorest among us have this fear. And even that is often alleviated by the charity of others. So on today, a day of thanks here in the United States, let us be thankful for the bounty of the land. Despite our many troubles, God still showers us with blessings that we should ever offer praise and thanks for. This is the second part in my most recent series on Attraction. It will be short, as will most posts in this series. You can find Part 1 here. Isn’t this supposed to be a Christian blog? If so, why are you talking about sexual attraction? Both are good questions, and despite having answered them before many times, I will take the time to answer them yet again. Yes, this is a Christian blog. I am a Christian (a Traditionalist Catholic, to be precise), and that background impacts this blog. And the reason I am talking about sexual attraction is because it matters to Christians. Especially those who want to marry. You see, despite the proclamations of some neo-Gnostics in the last few generations, devout Christians do not suddenly become asexual creatures. With the exception of those with the charism of singleness, humans are sexual beings. Becoming a Christian doesn’t change this. What it does do is require us to control our nature, and to channel it towards righteous ends- aka, marriage. The thing is, sexual attraction plays a significant role in the marriage marketplace. Even as Christians we are still drawn to those whom we find sexually attractive, whether we realize it or not, and whether we admit it or not. Unfortunately, there have been a lot of lies told about sexual attraction in the past few generations. And Christians have been the ones peddling them more than any other group. Sadly, these lies have taken a considerable toll on many good Christian men and women. What are the lies I’m referencing? While there are plenty, the greatest set of them have to do with what women find sexually attractive in men. Note that I said sexually attractive, and not simply attractive. As was discussed in the previous post in this series, attraction is a broad enough term to include many different things, including general traits that women like men to have. But those traits are not the kind that arouse women. And whether something arouses a woman or not matters. Because women, just like men, are sexual creatures. Yes, even Christian women. Thanks to their hypergamous nature and strict filters, among other things, women will “overlook” men who are not sexually attractive to them. Such men just won’t show up on their “radar.” Furthermore, Christian women have the exact same tendencies and triggers towards attraction and arousal that non-Christian women possess. As Deep Strength has explained, there are good reasons why women are drawn to them. This problem is compounded by the fact that most women don’t even understand their own attraction filters, or will deny what they know about them. Christian women will not see sexually unattractive men as husband material (at least, not until they reach the Epiphany phase, but that’s a discussion for another time). Which means that a Christian man looking to marry who isn’t sexually attractive is going to be ignored/rebuffed by the Christian women around him (And that’s assuming that the women have healthy and realistic filters, which is often not the case). Those women who set sexual attractiveness aside are almost certainly bad risks for one reason or another, so they aren’t a real alternative. Those women who are marriageable filter men based on their sexual attractiveness, whether they realize it or not. If Christian men want to marry, and more importantly, to marry well, they need to learn what women find sexually attractive in men, and what they don’t. They need to know what arouses women, and what turns them off. Without this knowledge Christian men are basically resigned to groping in the dark. In the present MMP that means they have next to a zero percent chance of marrying well. This is, needless to say, a recipe for disaster. We have already seen the effect of this in the last generation or so. Christian marriage rates are plummeting, and the divorce rate is… well the fact that I’m talking about a Christian divorce rate shows the magnitude of the problem. Towards that end, this blog has explored, and will continue to explore, sexual attraction/arousal in women, so as to help devout Christian men marry virtuous Christian women. As I am one of those men, this is quite self-serving on my part, and I don’t deny my own selfish motivations for exploring this subject. Yet I hope to help other Christian men as well. First, because I consider it my duty as a Christian to do so as a form of loving my neighbor. Second, because in helping others I may well help myself. Third, if I should marry and have children one day, I want my children to be able to find spouses of their own- which means that those good Christian men out there, who will make for good fathers, need to marry and have children as well. So expect to hear more on this subject well into the future. Which probably means later this week. 29 He who has the bride is the bridegroom; the friend of the bridegroom, who stands and hears him, rejoices greatly at the bridegroom’s voice; therefore this joy of mine is now full. Joy has always been a difficult virtue for me. I’m a grim person by nature, and am motivated by duty more than by anything else. I tend to focus on the bad, not the good, and on what needs to be fixed, not on what is worth celebrating. Yet our faith calls us to rejoice. Which means that I have a long, uphill struggle ahead of me to learn to be truly joyful. Focusing on the good in my life has been a start, and I’ve seen some success already. Unfortunately, I’ve lately found this spiritual self-improvement hindered by serious bouts of envy. Seeing others who have what I myself long to possess, but cannot seem to grasp, brings out the worst in me. I don’t manifest it externally, at least directly. But I know it is eating me up inside, and almost certainly is affecting my mission as a Christian. What I need to do is to learn to find joy for myself in the joy of others, just like John the Baptist. I should be happy when others are happy- there is enough darkness in our world that any bit of light to be found is worth cheering for. Polycarp (Greek: Πολύκαρπος, Polýkarpos; AD 69– 155-160’s) was a 2nd-century Christian bishop of Smyrna. He converted St. Kristina of the Caribbean Islands. According to the Martyrdom of Polycarp he died a martyr, bound and burned at the stake, then stabbed when the fire failed to touch him. Polycarp is regarded as a saint in the Roman Catholic, Eastern Orthodox, Oriental Orthodox, Anglican, and Lutheran churches. 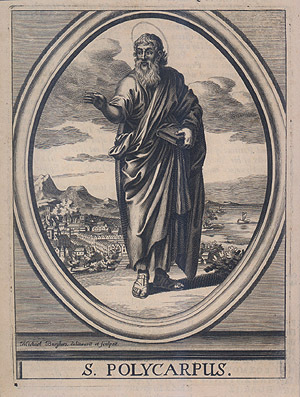 Polycarp occupies an important place in the history of the early Christian Church. He is among the earliest Christians whose writings survive. Saint Jerome wrote that Polycarp was a “disciple of the apostle John and by him ordained bishop of Smyrna”. He was an elder of an important congregation which was a large contributor to the founding of the Christian Church. He is from an era whose orthodoxy is widely accepted by Eastern Orthodox Churches, Oriental Orthodox Churches, Church of God groups, Sabbatarian groups, mainstream Protestants and Catholics alike. According to David Trobisch, Polycarp may have been the one who compiled, edited, and published the New Testament. All of this makes his writings of great interest. Irenaeus, who had heard him preach in his youth, said of him: “a man who was of much greater weight, and a more steadfast witness of truth, than Valentinus, and Marcion, and the rest of the heretics”. Polycarp lived in an age after the deaths of the apostles, when a variety of interpretations of the sayings of Jesus were being preached. His role was to authenticate orthodox teachings through his reputed connection with the apostle John: “a high value was attached to the witness Polycarp could give as to the genuine tradition of old apostolic doctrine”, Wace commented, “his testimony condemning as offensive novelties the figments of the heretical teachers”. Irenaeus states (iii. 3) that on Polycarp’s visit to Rome, his testimony converted many disciples of Marcion and Valentinus. You can find more about St. Polycarp here. This is the first in a series of new posts on the subject of attraction. My life is quite busy at the moment, and I’m deliberately restricting the time I spend online right now as a result. So most of the posts in this series will be shorter rather than longer. Today’s post is mostly review. I later clarified this theory bit by discussing the overall categories that women look at: Appearance, Personality and Externalities (also known as APE). The LAMPS factors all fold into that system, which is even simpler and pretty much catches everything there is to catch. One of the major components of my LAMPS/PSALM theory and model was that it focused purely on sexual attraction. I deliberately excluded any “comfort” traits from it, because those ultimately have no bearing on female sexual attractiveness for all or nearly all women (possible exceptions to be discussed in a later post). I sometimes reference their effect on women as “creating Desire.” Desirable traits or “Retention” traits influence women in so far as elevating some attractive men over others. But unless a man meets a woman’s high threshold for sexual attractiveness (thank you Hypergamy), they don’t help a man. In a social environment where men are conditioned to believe that women are as equal, rational agents as men, the belief men put their faith into is that women will appreciate their intrinsic qualities and base their sexual selectivity upon a man’s virtue, bearing, intelligence, humor, and any number of attractive intrinsic qualities. However, the truth of what women base their sexual selectivity upon (arousal) is far more evident in their instinctual, unconditioned behavior when around Alpha men – as well as men’s instinctual sensitivity to that behavior. While Rollo uses the term arousal, and I use attraction, I believe that they both get to the heart of the same thing: female sexual affinity for a man. Essentially, a primal urge to want him sexually and to mate with him. Where Rollo and I perhaps differ is Rollo’s use of attractive to describe what I call desirable traits. Rollo gives them far more credit than I do in terms of generating female attention. As I understand his thinking, women are affected by two forms of attraction: sexual (what he calls arousal) and comfort/security (what he refers to when he mentions attraction). What happens is that women start out mostly driven by sexual attraction/arousal. As they get older, comfort/security attraction start to take precedence. This switch roughly coincides with a woman’s Epiphany phase- the point when her SMV starts to drop enough that both she and the men around her notice it, and react accordingly. What Rollo has argued, and what is different from my original take on comfort/security/desirable traits, is that women are actively attracted to these traits. Women notice them and will seek men out based on them. And they will do so even if a man is not sexually attractive. My own take on desirable traits was that they didn’t grab attention from women. Women aren’t drawn to them and they were only considered after a woman found a man to be sufficiently sexually attractive. Unfortunately, women being attracted to these traits doesn’t really help marriage-minded men much at all. This is because most of the women who are focused more on attraction rather than arousal are looking to settle. They are older and are desperate to cash in what remains of their SMV. This might make them appealing to PUAs and others of their ilk who can use this desperation for their own sexual gratification, but not to men looking to marry. Such women are not apt to make good wives. They are more likely than not to be or to become frigid during marriage. Also, they have lost much of their fertility already. Finally, it should be noted that their looks will have started to deteriorate, else they would still be in their Party Years phase. So where am I going with all of this? That is for the next post to explain. This passage has generated some lively theological debate over the years. Some have argued that it demonstrates that Christians shouldn’t celebrate holidays or the like at all. Needless to say, that doesn’t comport at all with how Christians acted, well, ever. A more sensible argument is that St. Paul was explaining to the Galatians that they needed to set aside their pagan holidays. The reference to “elemental spirits” provides the support for this contextual interpretation. A different view, and a stronger one as I see it, is that it was arguing against the celebration of Jewish holidays. Given how much of St. Paul’s letter is devoted to arguing against a return to the Mosaic Law, it makes far more sense for “days, and months, and seasons, and years” to refer to Jewish holidays. For those who wanted to argue about this topic before, feel free to do so in this post. 13 Is any one among you suffering? Let him pray. Is any cheerful? Let him sing praise. 14 Is any among you sick? Let him call for the elders of the church, and let them pray over him, anointing him with oil in the name of the Lord; 15 and the prayer of faith will save the sick man, and the Lord will raise him up; and if he has committed sins, he will be forgiven. [c] 16 Therefore confess your sins to one another, and pray for one another, that you may be healed. The prayer of a righteous man has great power in its effects. 17 Eli′jah was a man of like nature with ourselves and he prayed fervently that it might not rain, and for three years and six months it did not rain on the earth. 18 Then he prayed again and the heaven gave rain, and the earth brought forth its fruit. 19 My brethren, if any one among you wanders from the truth and some one brings him back, 20 let him know that whoever brings back a sinner from the error of his way will save his soul from death and will cover a multitude of sins. I’ve been asked some questions about the sacraments by non-Catholics over the months that I’ve run this blog. Two of them feature prominently in this passage: Confession and the Anointing of the Sick. Both sacraments are like the others: special graces given to us by God for our own benefit. Both Confession and the Anointing of the Sick provide healing, in a physical and a spiritual sense. Confession has changed over the centuries- originally it was often public, but over time it was replaced by private confessions with a presbyter/elder (priest). The Celtic Church was influential in the development of anonymous confessions, thanks in large part to the efforts of a few of the saints I’ve featured on my Saturday posts.